Do you ever feel that your home just doesn’t get cool enough during the warm months or warm enough during the cold months? You have tried to adjust your thermostat to the right comfort level but it just never seems right. And on top of that, you notice that your utility bills keep going up and up. Even when you dial up the thermostat in the summer and dial it down in the winter to saving on energy usage, your bills are still about the same. That air conditioning condensing unit sitting in your backyard and the furnace in your basement should be making your home as comfortable as possible. But in many cases, they are not. That’s because whoever installed those HVAC system components didn’t do their homework on your home. The components were sized incorrectly. If a furnace or air conditioner is sized incorrectly, it usually cannot keep up with the demand for heat or cold and often puts such a burden on the equipment. As a result, regular failures and repair bills are commonplace. And it may not be the fault of the installing HVAC contractor. Over the years your home may have undergone renovations including additions and new windows, which have increased the square footage or demand for more heating or cooling. Those renovations may not have included upgrades to your home’s HVAC system. So how do you check for the right size? Call a professional Columbus HVAC contractor and ask for an inspection of your home. The inspection will include several key checks including a load calculation, which adds in the size of your home’s living space, number of door and windows where heat loss or gain could occur, and a check of heat loss or gain through leakage in cracks, roofs, crawlspaces, etc. They can determine what size of furnace or air conditioner is needed to meet the heating or cooling needs of your home and its own individual characteristics. Your HVAC contractor may also factor in the number of building occupants and normal usage patterns, i.e. having a home office or stay-at-home parent versus a working family where your home is occupied mostly at nights or on weekends. All of these factors are considered when determining the equipment size. In air conditioning jargon, you will hear about tonnage of cooling capacity. An example may be a 2.5 ton air conditioning unit for a 2,000 square foot home. In furnace jargon, you will learn about Btu ratings, which are British thermal units. Most furnaces are sized in 20-25,000 Btu increments. Each is matched to the cooling or heating needs of your home. Your HVAC contractor will likely recommend using a programmable thermostat, too. That way, you can set the temperature of one or more zones in your home to when each zone is occupied. Make sure you don’t hire someone who “guesstimates” how much cooling or heating capacity you need for your home. 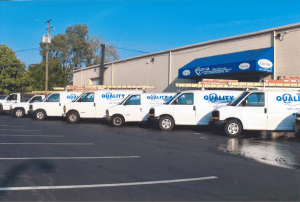 Find a qualified Columbus HVAC professional who will make the correct calculations and who will qualify their recommendations. A properly sized HVAC system will equate to manageable utility bills and above average indoor comfort. For more information about how make your HVAC system more effective, give Quality Air Heating and Air Conditioning a call!